The food you eat gets from the farm to your table, by moving from link to link along the “food supply chain,” which is a highly complex, delicately balanced and extremely fragile logistics system. Any international or national event, which causes the breakage of one or more links of the chain will disrupt food deliveries to stores, leaving you with little or nothing to eat, and at the mercy of anyone with morsels to sell at extortionate prices. To protect your family and to keep them well fed and healthy, you need to begin storing food now for later, when the food supply chain is disrupted and food is no longer available or affordable. You know the size of your family and how much food they consume every month, so you already have data to use in deciding your food storage requirements, but keep in mind that more is always better than less. The decision about how many months to prepare for is yours to make, and there is no “right” answer. There is no way of knowing how long any disaster aftermath will last, but being prepared for a short term 30-day natural disaster aftermath is a good place to start, until you wake up on the thirty-first day of a manmade aftermath. At that moment, you’re going to wish that you had made long-term survival preparations. 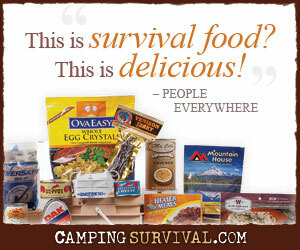 Surviving through a long term manmade aftermath means being able to make it through at least the first, most dangerous and challenging year with some remaining food to use for barter; seeds and implements for a survival garden, guns and ammunition for hunting and defense and tools and plans for building the rest of your life. There are dozens, perhaps hundreds, of websites (4) and blogs which go into infinitesimal detail about how many cups of some ingredient are needed to make “X’ quantity of something which then needs to be stored in some kind of container, for some period of time, before it’s even needed. When you look at the amount of food your family will need for even three months, let alone the amount needed for a full year, the practicality of doing it yourself becomes highly problematic. Not only would the cost of food, purchased piecemeal in small quantities be astronomical, when you add; energy costs for cooking, jars and containers for canning, purchase prices for dehydrator and vacuum packaging machinery and supplies, miscellaneous other kitchen equipment and the value of your time, it becomes apparent that doing it yourself is simply not cost effective. Beyond the upside-down economics of DIY, there are the questions of durability, longevity and safety of home packaged foods over as few as 10-years. On the other hand, most professionally packaged long-term bulk foods have shelf lives up to 25-years, with per day costs for 3 servings of food for 4 adults or 2 adults and 4 children for 12 months as low as $1.50 per person. Whether you make it your self or buy it, “More is better than less,” is true for a couple of reasons: First, you don’t want to see your family run out of food before relief arrives, commerce resumes or your first year survival garden is ready for harvest. The second reason is that, along with ammunition and tobacco, there will be no commodity in greater demand for barter than food, especially if it’s packaged in small, unbreakable Mylar pouches. Those folks who had stockpiled gold, or have other hard goods you may need will be eager to trade handsomely for even a small amount of your good food. In addition to having your own food you should be working in-community with like-minded neighbors who are also prepared; for aid, assistance and mutual defense. A large stockpile of food guarantees that your family will be in an advantageous position within any alliance you join. Next in the series is Hunting and Defense. Canning food yourself should be a part of a yearly rotated stocking program and is definitely NOT more expensive or less reliable than purchased food. This is doubly true if you grow your own, especially fruit trees and tomato products. Sure, stock up on rice and sugar and pack them to store for the long haul. But discounting canning this way is misinformed. I’m not discounting canning, and I agree that it is a necessary part of preparedness. What I’m saying is that hand canning a full year’s worth of food would be a MONUMENTAL task and would be enormously expensive, all things considered, as well as require huge storage spaces. We grow and can our own tomatoes and fruits, (figs, peaches, beets, and apples, as well as storing white and sweet potatoes last year), but all we have left now is a few jars of fig preserves and a quart jar of tomato sauce. Hardly sufficient for a year. Most people don’t have what you and I have, and need to know that they can be prepared, even if they can’t do it all themselves. For those folks and everyone else, the choice is make what you can make, and buy what you cannot make. While canning is a great option, most of us just don’t have the time now to grow all our food and do the canning, year after year. We have purchased a year’s supply from http://www.srmarketplace.com. Since freeze dried foods were new to us we have started to learn to cook delicious meals with it. It is already washed and chopped it is so convenient and fits our busy lifestyle. i also taught my daughters to can and we do a few batches of our favorites each year, but for emergency preparation we keep a years supply we purchased. It has a super long shelf life and the large cans can easily be stored under the beds. Thanks for your comment. You make my point exactly; most folks simply do not have the time, skills, supplies and kitchen equipment to “put-up” a whole years worth of food, not to mention storage space for all those quart jars. Preparedness requires more than just food storage: water storage and replenishment, tools, light and communication, off-Grid cooking/heat, first aid and survival kits, garden seeds, tents/sleeping bags and hunting and defense weapons are all necessary to be truly prepared. I think the big difference in buying a supply of canned goods and canning your own produce comes down to sustainability. For those who are not interested or who do not possess the skills/time to can produce, buying in bulk offers a good way to store food. However, for the longer term, having a food system that is based on a non-replenishable supply like bulk foods makes those who are more sustainability-minded a bit nervous. As with so many questions, the answer it is depends on your capabilities and goals. Exactly Joe. It comes down to whether one should be defined as a “prepper”, a “survivalist”, a “minimalist”, or even (what would be the word for) one who wants to be sure he knows how things USED to be done, hundreds of years ago. Buying a year’s worth of freeze dried food, or ten years worth, etc, gives you time to figure out how to live in a pre-industrial way, but already knowing those skills gives you a jump start. Canning isn’t a long term answer either, because those lids and rubber gaskets are going to run out sooner or later. You’re right, Jimmy. A while back we switched to the Tattler canning lids. They are reusable, but not indefinitely. At some point, they’ll wear out too and we’ll have to figure out other ways of preserving food. That’s one reason we’ve built a root cellar. Hopefully that’ll help us keep some of the produce we’ve grown for a little while at least. Sustainability is a nice concept for well-fed folks sitting around talking about survival preparedness, prior to an era-ending event. After the event, the focus of sustainability discussions will shift from long-term food production, to the immediate need for sustenance. The main questions are; how much of the food that folks eat now, in the fat-easy times, do they grow and can for themselves, as opposed to how much of their food they must purchase? And, even if they have a garden, is it productive enough to feed them today and still have enough to “put-up” for a year’s worth of tomorrows? It’s more than not having the interest, skills or time to preserve their own produce. For the vast majority of people the problem is having; neither produce to can, the skills, kitchen and equipment with which to process it nor space in which to store the mountain of quart jars comprising a full year’s supply of food. We have a veggie garden, an asparagus patch, a potato patch, a raspberry patch, fruit trees and grape vines. Last autumn we dug 50+/- lbs each of potatoes and sweet potatoes. We canned figs, peaches, apples, beets, cabbage and tomato sauce. It’s now Memorial Day and there’s very little left of last year’s food. What is left would simply not be enough to feed us for the remainder of the year, no matter how tightly we rationed. Had we been unable, for any reason, to buy groceries we would not have made it through the winter, in spite of all the advantages we have over millions of folks. Which is better; buying long-term bulk food storage, or growing and preserving your own? The answer is: Both! The only folks, who might be capable of being completely food self-sufficient and have absolutely no need to buy bulk foods, are those who own a full-scale farming operation producing sufficient quantities of fruits, vegetables, meats, poultry, dairy, eggs and grains. The rest of us must acknowledge that; buying bulk food storage or growing and canning food storage, are NOT mutually exclusive components of a survival preparedness plan. Depending on our own capabilities and goals we must each decide how much of one is possible and how much of the other is necessary and accept both, as valid and effective tactics for achieving the objective: SURVIVAL! I’ll be the first to admit that a well prepared person should have already secured themselves 40 acres or more of prime land with a creek and a pond and a nice hill for the house. There are too many people now for us all to be capable of being completely food self-sufficient, but how many of us would even know where to start if the land became available? It’s the rare prepper who can grow enough to sustain his family today and have enough left over to store for the future. Even if he can, there are some things that he would like to store yet he simply cannot grow in his geographic region or in his backyard. For example, rice, wheat, peaches, beef, chicken, etc. So from that perspective, buying and storing food is good. On the other hand, canning produce that you’ve grown or purchased from the farmer’s market is good as well. You learn a skill, acquire much needed supplies, and have a heathy alternative to the food stuffs available at the big box stores. In the end, I don’t believe it’s a matter of “either or” but a matter of balance. Some will be at one end of the spectrum (buying almost all of their supplies) and others will be at the opposite end (growing almost all of their food). However most of us will be some where in the middle. That’s where we are, somewhere in the middle. We strive to become more self-sufficient to prepare for a day when the supply chains are disrupted. But until that time, we’ll purchase food to supplement what we grow/can. Here we are; Jimmy, Joe and Luke, sitting in our separate choir seats, hunched over our respective keyboards, all preaching slightly different versions of the same sermon to each other. It’s like this with any item I post, here or anywhere. Whatever the subject, the only responses come from other “preppers” who ALWAYS have everything THEY need to survive, and are anxious and proud to proclaim THEIR preparedness. The people I’m trying to reach, the people who need to be reached are those who are NOT prepared. Those who need to know that they are not required to start a new; time consuming and expensive hobby called “prepping,” in order to quickly become prepared to survive until services are restored, commerce resumes and whatever “normal” has become is (re-)established. Being prepared to survive does not guarantee survival. Being prepared to survive the first year does, however, guarantee that the survivor will have the opportunity to trade whatever skills or goods he does possess, for a haunch of bear meat with someone who knows how to talk a bear into giving-up his haunch. Survival is the objective and there are numerous ways to get there. None of them are rigidly; THIS to the exclusion of THAT but rather…any combination of those choices and others, one finds necessary to achieve the objective.